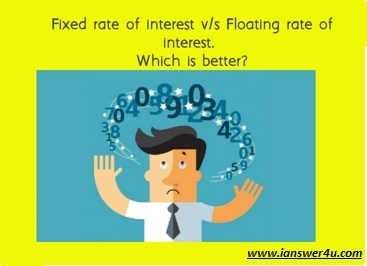 Difference between Fixed Rate of Interest & Floating Rate of interest? Any borrower of money, either an individual or an institution is expected to pay an extra amount over and above the actual amount of loan to the lender at the time of repayment. The extra amount paid is called interest and the actual amount of loan is called principle. Interest to be paid by the borrower to the lender is calculated as a percentage of the principle. Hence, the term Interest Rate. There are broadly two systems of interest rates charged by banks and financial institutions or any lender following an formal system of lending: The fixed rate of interest and floating rate of interest. Here is a simple explanation for the two! When a lender- a bank/ financial institution or an individual lends at a predefined and unchangeable rate of interest to be paid by the borrower on the principle (amount of loan) for the duration of loan irrespective of what happens to the interest rates in the country in the future, the rate of interest is said to be fixed. Fixed rate of interest is a better choice for a lender if he expects a fall in the interest rates in the future. So, he would profit from receiving a higher rate of interest even when the general interest rate levels are down in the future. On the contrary, this would be beneficial for a borrower if he expects the rates to rise in the future. In this case, he would enjoy paying a lower fixed interest rate irrespective of the higher rates in the future. Let's say that at the time of lending, the lender specifies the interest rate (to be paid by you) on your loan to be LIBOR+2%. This means that your interest rate is not fixed but rather variable. It may rise in the future if the LIBOR rises and fall if the LIBOR falls thus requiring you to pay more and less in the cases respectively. Thus, under this rate of interest the rates are completely dependent on the base – LIBOR. Going by the same logic as above for a lender, floating rate of interest is ideal if he foresees a rise in the interest rates in the future but for a borrower it is rational to choose a floating rate of interest if he expects a fall in the interest rates in the future. Which is better, a fixed or variable rate loan? From the above you may realise that you should opt for a fixed rate of interest for your loan if you are expecting the future rate of interest in your country to be higher than they are now and choose a floating rate of interest if you are expecting a fall in the interest rates in the future. The exact converse will be true in case of a lender. You would know this if you're reading the newspapers or financial tabloids that discuss about the future plans of the Central Bank of your country or your lending bank/ institution. If there are signs that the Central Bank or your lending bank is likely to rise the rates of interest, you as a borrower should know that a fixed rate of interest is what you must choose today. OMO or open market operation is a quantitative financial tool by which a country’s Central Bank (The Federal Reserve System of the U.S.A., the European Union of the U.K., the Reserve Bank of India, the People’s Bank of China and all others) regulates the supply of money in its economy. A Central Bank’s main responsibility is to keep the inflation in check by managing the money supply, ensure that enough foreign reserves are maintained and the value of the currency is stable and not volatile in the constantly changing global relations and scenarios. What is an OMO or Open Operation? OMO means that a country’s Central Bank (central bank) involves in either purchase or sale of the government securities from and tothe banks operating in that country. The central bank performs this on behalf of the Government of that country. OMO takes place constantly between the banks and the central bank to keep the amount of money supply in the economy in check. When does the central bank perform an OMO sale ad when does it perform an OMO purchase? If the central bank witnesses a rise in the inflation which means that more money is chasing fewer goods thus implying that there is money in the economy, the central bank announces an OMO sale i.e. the sale of securities in return for money from the banks. By this, the central bank has sucked out money from the banks which are the vehicles of money supply. Now, with quantity of money having become less, lending becomes difficult and so the lending rates rise. With this rise, deposit rates also rise in the banks. If the economy is facing a shortage of money and the rate of inflation is below the required level it means that there is a difficulty in conducting day-to-day businesses in that country. So, the central bank steps in and decides an OMO purchase whereby it purchases the securities from the banks and gives them money. With this, the banks become money rich. Lending gets cheaper and easier. As a natural consequence deposit rates fall because the people are interested in borrowing at cheaper rates from banks and investing in business and infrastructure projects or simply any money churning activity. So, how are bond prices related to all this? How does OMO affects bond yields? Now, with higher deposit rates being offered by the banks after an OMO sale, the bond investors feel that the coupons they would receive from buying an older bond would be lesser attractive than the new deposit rates and as a result they are willing to pay lesser to buy the old bonds.Hence the price of the old bonds begins to fall with an increase in interest rates in the economy. Therefore interest rates and bond prices are inversely proportional. The exact reverse would happen in the case of an OMO purchase. Let’s understand this with a $100 investment comparison through this table. It can be seen that after an OMO sale the bank offers a better return than the bond investment. And so the people agree to buy the bonds for lesser as they are getting lesser returns. Thus, an OMO sale brings the bond prices down and an OMO purchase pushes the bond prices up.